We Carry a Variety of Wholesale Miscellaneous Liquidation Lots. Please review the listings below for further details. Opportunistic liquidation of assorted Umbrella Base Weight and more! This liquidation includes approx. 4,453 assorted base weights for umbrellas and approx 320 units of aluminum magnesium alloy swivel/carabiners. 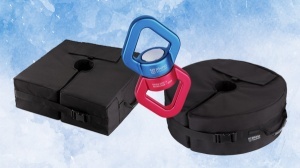 The assorted base weights include the following styles: Rhino BaseMate™ 2 Detachable Base Weight Bag in various colors, Rhino BaseMate™ Round Base with Side Slot Opening in various colors, & Rhino BaseMate™ 18" Square Base weight with Side Slot Opening in various colors. Please review manifest for details. The products retail from $21.98 and up. Total Retail value of the load is over $130,000. Your price is 7% of Retail or just approx. $1.93/unit. With Rhino BaseMate™, you don’t have to worry about fly away umbrellas anymore. Great product for Retailers, Outdoor Furniture and Patio Stores, Online Sellers, Exporters, and more!